Addressing topics like bullying at a relatively young age is a great way to help kids prepare for possible conflicts that commonly occur in schools and communities. It's helpful to look at bullies objectively with an understanding that some life lessons can be difficult. Picture books are wonderful tools for developing a greater understanding of the problem and they often offer children creative solutions. Bootsie Barker Bites takes a delightfully-humorous look at a teeth-baring bully named Bootsie. The otherwise adorable little girl is a terror for her reluctant companion. The two kids are brought together by their mothers' close friendship. Mother-daughter visits can be great fun, but they can be scary with overbearing biters like Bootsie. The exaggerated tale is well-illustrated with vividly colored illustrations that bring the characters to life.This book is a nice tool for helping kids to see the humor in uncomfortable situations. Kirkus heralds the book for its "vividly expressive characters," and its "entertaining and insightful glance into a child's world." They also state that the illustrator nicely matches the author's storytelling due to her "vividly expressive characters drawn with bold broken lines while every stance--even the toys'--comically echoes the narrator's feelings." This delightful, multiple award winning book finds a young girl named Carla bringing sandwiches created with strange ingredients to school for lunch. Although she's regularly teased for her unique lunch concoctions, she stays true to herself and her quirky style, eventually winning over her classmates. The story will ring true to kids who have experienced a "lunch bully," and help empower them to stand up for themselves. When Jeremy Ross moves to a new home, he quickly establishes himself as the neighborhood bully. However, a resourceful boy utilizes his father's unique "enemy pie" recipe to stop Jeremy's bullying and teaches all involved a valuable lesson about friendship. 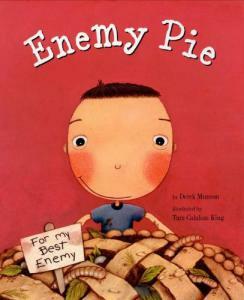 Enemy Pie is a Reading Rainbow book and made Publishers Weekly's selected bullying resources book list. 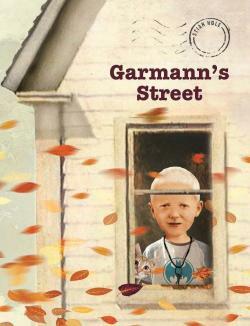 Garmann's Street follows a young boy named Garmann as he strives to deal with peer pressure from a neighborhood bully. When he gives in to that pressure and accidentally sets fire to an elderly neighbor's yard, he develops an unlikely friendship with the older man and realizes that he has nothing to fear from the bully. Kids don't always associate peer pressure with bullying, and this book helps them see a different side of the equation. The story won a 2009 Outstanding International Book award from the United States Board on Books for Young People. Hooway for Wodney Wat features a young rat named Rodney who struggles to pronounce the letter 'r.' When a new student arrives in the classroom, determined to bully Rodney and his classmates, Rodney finds the courage to stand up to her and keep the peace. The book is accompanied by a professionally-narrated CD and was chosen in 2000 as one of American Library Association's Notable Children's Books. In addition, the book is featured by Scholastic for use in the classroom to open up dialogue about children's differences. Blue is a quiet color who is being bullied by Red. Although the other colors hate what's going on, they don't know what to do -- until One comes along and shows them. This wonderfully creative story helps kids approach the problem of bullying and learn about their differences, while teaching them basic number, counting, and color concepts. The book has won several impressive awards, including the 2009 E.B. White Read Aloud Honors Award for its unique approach to the topic of bullying. 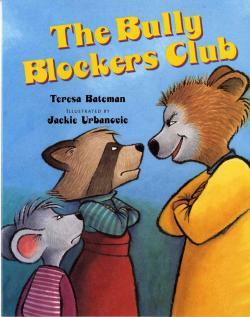 The star of The Bully Blockers Club is about a young raccoon excited about the start of a new school year. When she and her classmates are bullied, they find the courage to take action and form a club to stop the bully. The book helps children learn that even the toughest bullying problems can be solved by pulling together. This book is included on the Goodwin Holocaust Museum and Education Center's Teaching Tolerance storybook list and was chosen by the National Council for the Social Studies as one of the Most Notable Books of 2005. This story is a gold Mom's Choice Award winner. The Juice Box Bully (Empowering Kids to Stand Up for Others), features a bully named Pete who decides to start bullying his first day in a new school. Pete learns a valuable lesson when his classmates decide not to be bystanders to bullying and stand up for one another. The National Council for the Social Studies chose The Recess Queen as one of its Notable Books of 2003. The story features Mean Jean as the reigning playground bully who enjoys intimidating any child she comes in contact with, until Katie Sue arrives on scene. Instead of being frightened of Jean, Katie Sue befriends her, teaching her a valuable lesson in the process. Publishers Weekly states that the author's interpretation of what happens at recess is authentic, and the book stays true to the drama of the situation while offering humorous details and text that "brim with fun-to-say phrases that fit a rollicking rhythm." When Lily Jean moves to a new neighborhood, she's more than happy to play with the sisters next door - as long as she gets to boss them around. The sisters soon tire of Lily Jean's bullying and find a creative way to solve the problem. 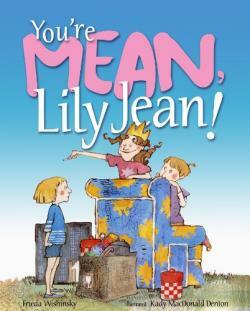 You're Mean, Lily Jean features whimsical, watercolor illustrations, and Publisher's Weekly says the book "brings a welcome reportorial cool to the bullying story." Picture books are a great way to address bullying before the bullying gets serious. A good story may help a child see his behavior as wrong. Perhaps more importantly, using a picture book to open up discussion on bullying and bullying behavior, may help your classroom as a whole, come up with creative and significant ways to deal with mean behavior.